GROUPING BY COUNTRY: The meeting room was organized around seven tables, one per Country. The vast majority of the activities were carried out on a “National Group” basis. We had to face logistic problems as the table in the room were very hard to move and the configuration with seven “islands” could hardly be transformed during the day. Anyhow, our approach resulted to be positive and stimulated the Teamwork. Suggestion: dedicate much attention to the facility and the logistic issues. It is a crucial point as most of the meeting rooms are equipped with very traditional furniture that does not stimulate interaction. Big round tables work as obstacles rather than platforms for communication while small mobile tables work much better. As a compensation for the logistic difficulties, we used every activity to offer the National Teams the opportunity to interact with the others, promoting discussions and sharing at different levels. In particular, the long session dedicated to the exposition of the Case Study offered an effective occasion to interact personally and as a group with the other Teams, creating very interesting dynamics. The use of mobile microphones helped in maintaining the sessions vivid and generate dynamism during the discussions. To integrate off-site participants into the discussions and sessions of the Workshop. Luca Servo, who acted as team coordinator and photo reporter. A twitter flow reporting about major steps taking place during the training. CCG I – Initial meeting by ROLE (Tuesday, lunch) to stimulate contacts within homogeneous groups of people with similar tasks inside the projects (Project staff, NPCs/NPDs/NPMs, ComDev consultants). The Facilitation Team got this occasion to join the group of National Project Coordinators. CCG II – THEMATIC lunch (Wednesday, lunch) to offer the chance to discuss specific topics identified by the participants. CCG III – Final meeting by ROLE (Friday, lunch) to ideally close the round of contacts within groups with similar tasks. The Facilitation Team got this chance to join the group of Communication Consultants. CONCLUSIONS: The Workshop was a great success. We were able to get participants fully involved in the activities and develop high level of interaction. 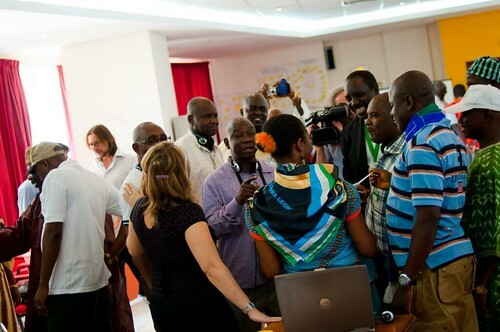 The final evaluation demonstrated the appreciation for the adoption of new techniques, an informal approach and a participatory methodology. This experience strongly confirmed our beliefs and suggestions: we highly recommend to embed the Communication for Development component in every Development project/programme and to develop such a Workshop, at least twice during the life of a project: once at the very beginning of the implementation and another one at the very end. 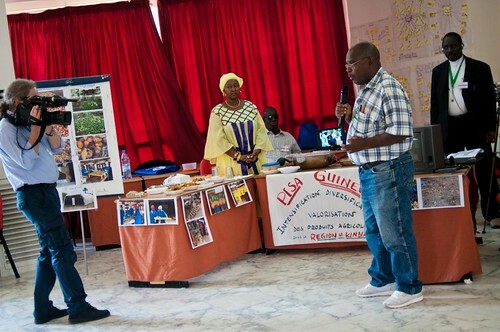 Categories: reports | Tags: Africa, capacity building, comdev, communication for development, dakar, development, facilitation, FAO, FSCA, fsca-pisa, interaction, km, knowledge sharing, lessons learned, needs, objectives, people, senegal, support, talk share, trainning, workshop | Permalink. In addition, we prepared also a detailed plan for facilitators only, with more information such as: name of the facilitator, learning objectives, description and details of the activity, facilitation technique, materials and specific support required, and a long list of notes taken during the prep meetings. These notes were very important to give a shape to the flow of the training and collect all the reflections done by the Team members during the preparatory works: I strongly suggest to collect them. It really helps keeping record of the logical evolution of the planning as you can easily lose track when the preparation takes long. The Social Reporting Team, to provide direct feedback on the activities and get participants involved in the use of Social Media. Moreover, in the effort to stimulate higher attention in the audience, the Facilitation Team decided to avoid powerpoint presentation. Initially, this decision provoked astonishment in the participants but it produced positive results in stimulating people’s fantasy and creativity, especially during the presentation of the Case Studies (see the photo below!). Introducing important tools like the Case Study exercise and the SWOT analysis were significant steps. At the end of the training, we asked for a punctual evaluation both of them, receiving, respectively, a 52% and a 70% of positive votes. Categories: reports | Tags: Africa, capacity building, comdev, communication for development, dakar, development, facilitation, FAO, FSCA, fsca-pisa, interaction, km, knowledge sharing, lessons learned, needs, objectives, people, senegal, support, talk share, training, workshop | Permalink. 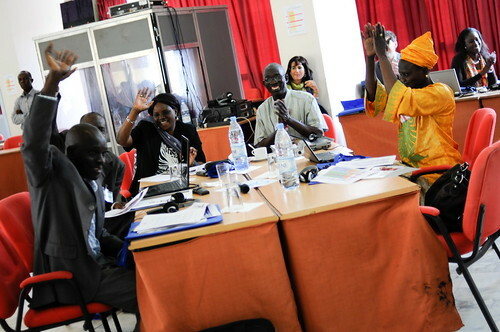 The training on Communication for Development organized for the FSCA-PISA programme was a great success. 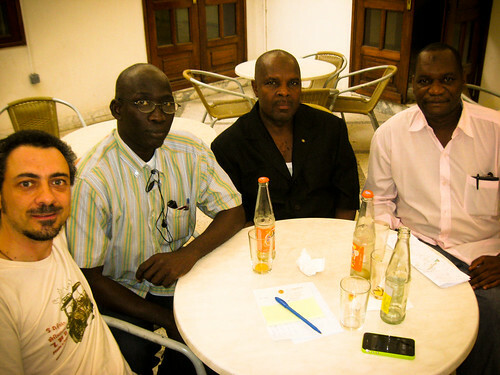 We saw enthusiasm and a lot of interaction during the five days spent in Dakar with the seven National Teams. Now it is time to put order among all the innovations we introduced. My first notes are about the Organization and the Language issue. 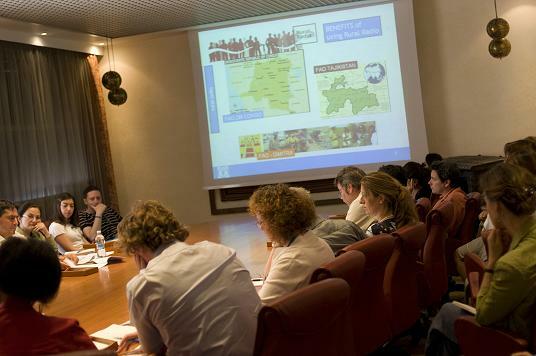 ORGANIZATION: the FAO Facilitation Team composed by Riccardo, Silvia, Antonello, Catherine, Elena and I worked for long time on the preparatory activities. 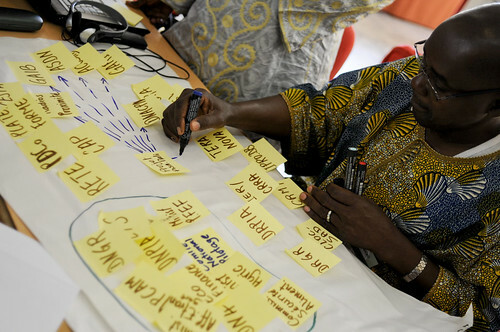 The original idea of delivering a technical training was launched early 2010 and evolved into a broader event, aimed at discussing ComDev in general. The debate on the objectives took long. 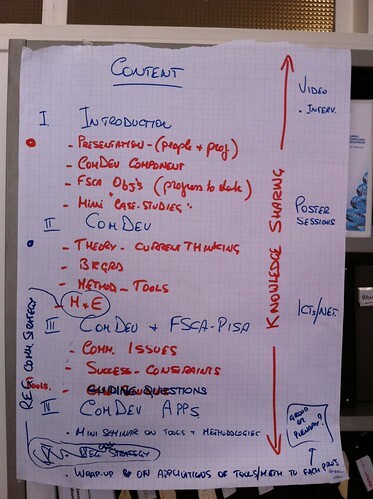 At the end, we decided to approach ComDev as a whole rather than focusing on a specific tool (the web, in our case). This choice answered to the perceived need to clarify ComDev concepts and details among the FSCA National teams. The first discussions took place before Christmas. 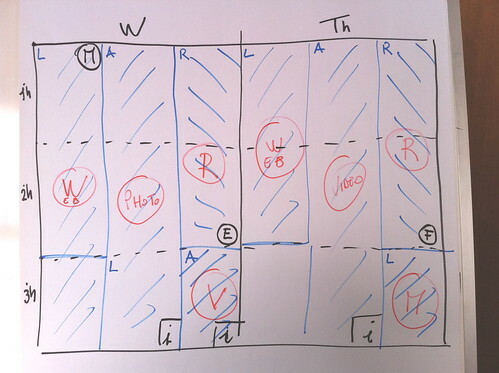 At the beginning we defined objectives, target audience and a draft calendar of activities. Then, one meeting after the other, we got into each macro activity to define it in details, from the learning objectives to a precise timetable. 7 COUNTRIES and 2 LANGUAGES: the language issue was one of the main problem to afford. Both the organization and the content were strongly influenced by this factor, in every step of the preparation. 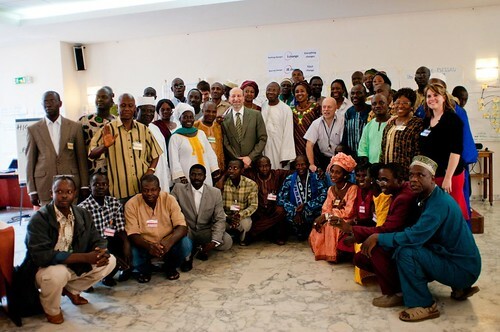 The initial idea of having two different sessions, one for the Anglophones and another one for the Francophones, was abandoned in favour of one single workshop with interpretation provided to the two groups. As a consequence, the budget, the agenda, the schedule, the content and the logistic were deeply affected. I admit that this was the right choice to do: being an introductory training to a strongly participative but relatively new discipline for the participants, the one-group approach highlighted all its strengths. At the end of the event, people’s appreciation for meeting all together confirmed this idea. Suggestion: do not underestimate the problems and the costs due to interpretation of the workshop and the translation of the documentation. Moreover, test the ability of the interpreters and provide them the training material well in advance.